Rudbeckia fulgida var speciosa is a holder of the Royal Horticultural Society's prestigious Award of Garden Merit (AGM). This attractive North American perennial is perfect for the naturalistic prairie-style planting schemes that are fast becoming popular. More drought-tolerant than most Rudbeckias, it produces masses of orange-yellow daisy-like flowers from late summer to mid-autumn. Rudbeckia is a plant genus of 23 species in the family Asteraceae. The species are commonly called coneflowers and black-eyed Susans; all are native to North America and many species are cultivated in gardens for their showy yellow or gold flower heads. The species are herbaceous, mostly perennial plants (some annual or biennial) growing to 0.5-3 m tall, with simple or branched stems. The leaves are spirally arranged, entire to deeply lobed, 5-25 cm long. The flowers are produced in daisy-like inflorescences, with yellow or orange florets arranged in a prominent, cone-shaped head; "cone-shaped" because the ray florets tend to point out and down (are decumbent) as the flower head opens. Rudbeckia fulgida var speciosa are from the prairies of the United States. They thrive in sun or partial shade and flower for a long period from late July well into autumn. They tolerate drought but are not really fussy about soil type. Deadheading is worthwhile with the early flowers, but as flowering comes to an end, leave on a few seed heads on the taller varieties to add winter interest. Cut down Rudbeckia fulgida var speciosa to just above ground level in late winter. 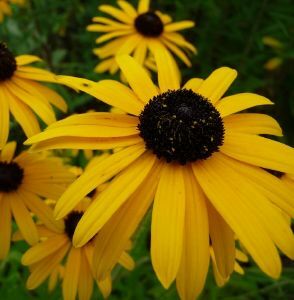 Uses: Rudbeckia fulgida var speciosa is great as cut flowers and is a great attraction to butterflies.